Risotto is a dish unbound by season. As with minestrone (see me recipes for autumn and spring), the best seasonal produce can be used to great effect in this famous Italian rice dish. There is no ingredient on earth that can’t be put to bewilderingly good use in risotto, a fact that makes it very special and probably unique. 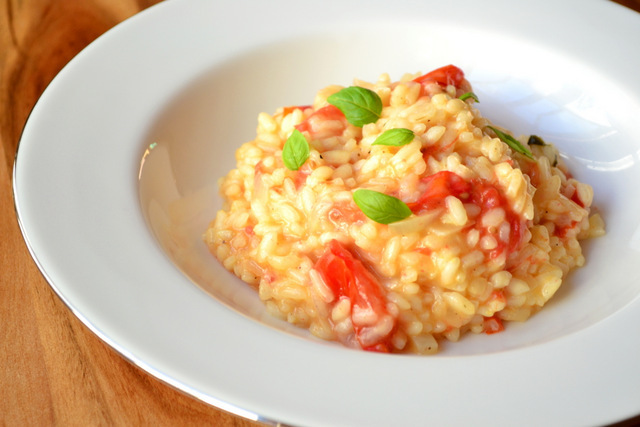 Indeed, to celebrate the beginning of the British tomato season, this recipe for Tomato and Basil Risotto makes full use of the fruit’s flavour, texture and colour. Delicious is an understatement. 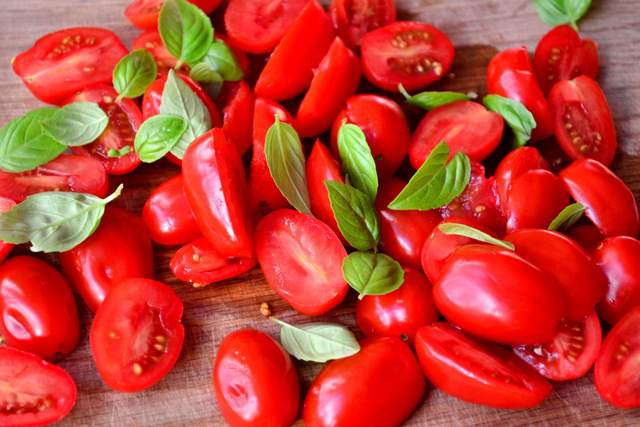 It can be tricky to know when to add tomatoes to a dish. For instance, if you add them at the beginning they tend to break down and form a sweet sauce, whereas if you add them near the end they retain most of their juicy plumpness and bite. When preparing a dish based on fresh tomatoes I always have a good ponder about what the end result should be – planning ahead like this is a must. In the case of this Tomato and Basil Risotto I thought it best to go somewhere in between sauce and fresh. 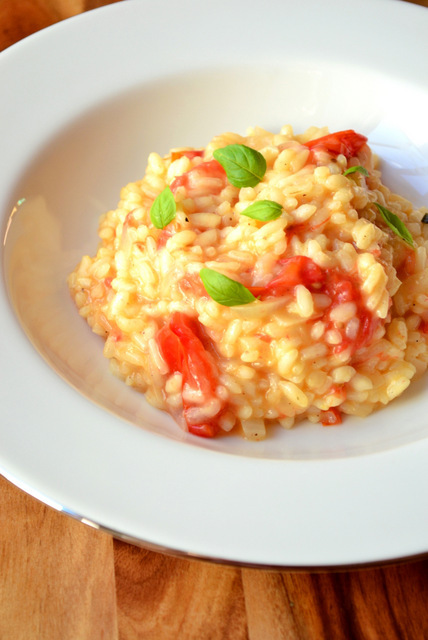 Doing so means the tomato colours the risotto and conveys some of its sweetness, which works very well with the basil, while also providing little pockets of juicy deliciousness in every mouthful. Tomato and basil is a timeless combination – the sweetness and fragrance of each of them simply works so well in tandem. I can’t think of a better way to celebrate the arrival of summer weather than this risotto. Having said that, do you have any combinations you feel would top this? Impress me! 1. Begin by sautéing the onion and garlic in a little olive oil. Once translucent add the rice and cook for a minute or so, stirring frequently. Add the wine and cook out, begin adding the stock one ladle at a time stirring all the while. 2. Once two thirds of the stock has been used add the tomatoes, keep stirring and adding the stock until the rice is al dente. Throw in the basil, butter and cheese and set aside (off the heat) with the lid on for 3 minutes. Season and serve with a little extra basil. Cost: The great thing about tomatoes starting to come into season is that they can be bought for an extremely reasonable price. We got around 800g of cherry tomatoes for £1.50, a price not to be sniffed at. As such, this dish should set you back no more than around £4. What beautiful tomatoes and a stunning risotto! Beautiful, what a cracking risotto, lovely fresh flavours that match the time of year, my usual is milanese or mushroom, but will try this one now. Have always wanted to do a bone marrow risotto, have heard it’s very good. I have tried tomatoes in risotto but put them in the oven to roast and then added them near the end. Yours sounds absolutely delicious, will be trying it, thanks! A beautiful dish to celebratesummer’s bounty, or indeed that of any season. Very nice looking risotto. I can’t wait for my tomatoes to ripen. Ooh, that looks nice – love tomato season! I love risotto! We haven’t played much with the flavors beyond our favorite tomato and mozzarella version. I use all olive oil – no butter. We have another few weeks until tomato season here in the Midwest. I can’t wait! Very beautiful, Nick! Baby basil leaves are so cute! Perfect timing. I’ve just been given a punnet full of cherry tomatoes, and love risotto. So I can’t wait either. Bellissimo! What a lovely seasonal dish! It looks so light and delicious. The tomatoes look perfectly cooked, as you said, somewhere between sauce and fresh. Well done! Love the baby basil leaves! So true. Risotto is a great canvas for fresh ingredients. Lovely post. My windowsill basil just got big enough to use… I know where I’ll be using it now! 🙂 Looks so yummy! Yum!! I just ate tomato and zucchini risotto – what funny timing!! Those tomatoes are gorgeous! What happened to your “like” button? Like buttons seem a little too “new age” and fickle… I prefer a good ol’ comment! I remember reading in one of Jamie Oliver’s books how he was dubious about tomato in risotto, but that it really works. The texture of yours looks lovely, yum. I am too, but if you do it right, it does work well. It looks delicious! I can’t wait to try this one… especially since my frugal eating has left me stuck in a boring pasta rotation. 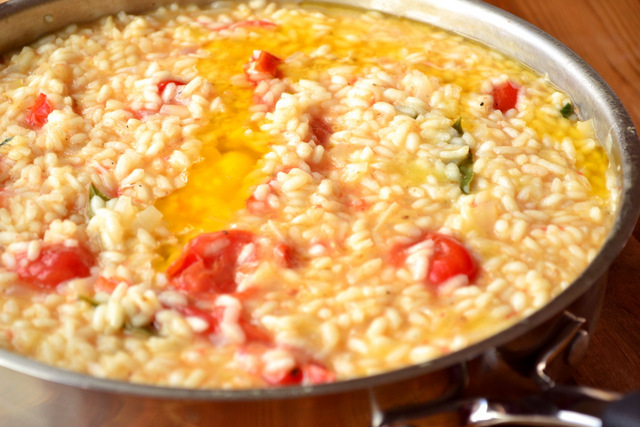 I absolutely love risotto and can’t believe I’ve never tried it this way! I’ll be making this soon! Yum I will have to try this recipe, I love risotto. This looks delicious Frugal! 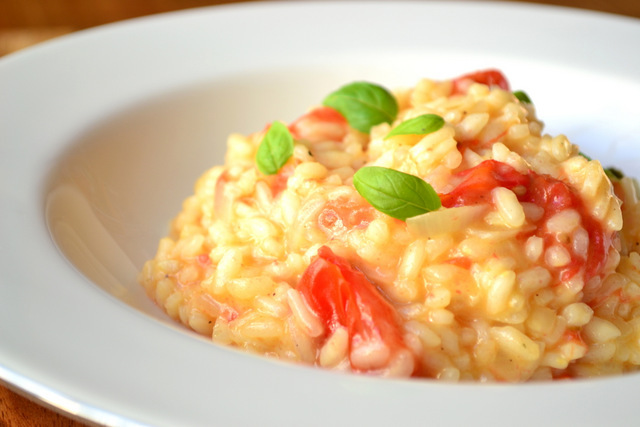 Love fresh summer tomatoes and combined with fresh basil this makes the perfect summer risotto. Beautiful photographs, makes me want a dish right now. 🙂 Have a lovely week! Oh, I think I need to make this with oven roasted tomatoes, and maybe some lemon zest too… delicious! Thanks for the inspiration Nick. That is a beautiful looking risotto! I love the detail of the small, fresh basil leaves on top. The fresh tomato shot is wonderful! This looks absolutely delicious, and so perfect for summer! Thanks – definitely good for this hot weather. This wonderful risotto dish combines three of my favorite summer ingredients – fresh corn. vine-ripened tomatoes, and basil. I’ve made one with cheddar before – cheddar has such a good flavour! Had this for dinner tonight, yum yum in my tum. I also added some chickpeas, courgettes and peas. The tomatoes were a lovely addition I wouldn’t have thought of. Thank you for a lovely recipe. I LOVE risotto! So satisfying. The stirring is a bit tiresome, but definitely worth it! Gorgeous photos as always! I love risotto, so versatile, just change the vegetables and enjoy a new and refreshing recipe everytime. Your combination of flavors is really tempting! Great idea! I’ll have to try it. Arancini are delicious. I can’t believe I’ve never thought of this before. Tomatoes basil and Risotto are on the list of my favorite things in the history of the world. You are a genius. I can’t wait to try this with home grown tomatoes and basil. Thank you thank you thank you!